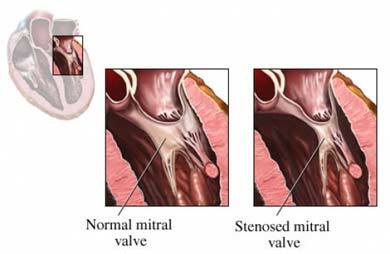 Mitral stenosis is a narrowing of the mitral valve in the heart. This valve is located between the upper chamber and the lower pumping chamber of the left side of the heart. Blood must flow from the atrium, through the mitral valve, and into the ventricle before being pumped out into the rest of the body. Mitral stenosis can result in poor blood flow between the two left chambers, which can affect how much blood and oxygen is getting to the body's organs and tissues. The most common cause of mitral stenosis is rheumatic fever , which scars the mitral valve. Less commonly, there are some congenital heart defects which may affect the mitral valve and its function. Very rare causes include bacterial endocarditis , blood clots, tumors, or other growths that block blood flow through the mitral valve. If you have mild mitral stenosis, your condition will need to be monitored, but you may not need immediate treatment for symptoms associated with mitral stenosis. When symptoms become more severe, you may need more aggressive treatment, which may include avoiding exertion and high-salt foods. Although no longer routinely recommended, you may need to take antibiotics prior to some dental and medical procedures. This is to prevent heart infections. Ask your doctor if you will need to take antibiotics. You may also need to take antibiotics when you have certain infections. This will help prevent further damage to your heart. Mitral valvulotomy—A surgical cut or enlargement is made in the stenotic mitral valve to relieve the obstruction. Balloon valvuloplasty —A balloon device is inserted into the blocked mitral valve to open or enlarge the valve. This may provide temporary relief of symptoms. However, the valve may become blocked again. Mitral valve replacement —This is the surgical replacement of a defective heart valve. This surgery is usually delayed until symptoms are severe or the person can no longer be helped by other procedures. Get prompt treatment for any infections, especially strep throat . Talk to your doctor about prophylactic antibiotic treatment to prevent recurrent strep infections. Follow any treatment plans to manage chronic health conditions. Avoid excess caffeine and alcohol, and all illicit drugs that speed up your heart rate. Exercise regularly and monitor your salt intake. Fauci AS, Braunwald E, et al. Harrison's Principles of Internal Medicine. 14th ed. New York, NY: The McGraw-Hill Companies; 2000. Mitral stenosis. EBSCO DynaMed Plus website. Available at: http://www.dynamed.com/topics/dmp~AN~T115920/Mitral-stenosis . Updated May 31, 2017. Accessed September 12, 2017.